Due to the modernization of the Japanese Language in this era, the Kuzushiji script is no longer taught in the normal school curriculum. Even though, Kuzushiji had been used over 1000 years most Japenese today cannot read or write books written over 150 years ago! There are over 1.7M books registered in General Catalog of National Books and over 3M unregistered books and over 1B historical documents and besides some of these being digitized, only people who knows Kuzushiji can read these documents. This paper introduces a dataset specifically made for ML research and introduce the ML community to the world of Japenese Literature. The paper releases benchmarks for the Kuzushiji-MNIST and Kuzushiji-Kanji datasets using recent models. Kuzushiji-MNIST can be used as a replacement to the normal MNIST dataset. The paper also applies generative modelling to a domain transfer task between unseen Kuzushiji Kanji to Modern Kanji. The Kuzushiji dataset is created by the National Institute of Japanese Literature (NIJL) and is curated by the Center of Open Data in the Humanities(CODH). Kuzushiji full dataset was released in November 2016, and now the dataset contains 3,999 character types and 403,242 characters. One characteristic of Classical Japanese which is very different from Modern Japanese is Hentaigana(変体仮名). Hentaigana are Hiragana characters which have more than one form of writing as they were derived from different Kanji. Therefore, one Hiragana class of Kuzushiji-MNIST and Kuzushiji-49 may have many characters mapped to it (as seen in the above image). This makes the Kuzushiji dataset more challenging than the MNIST dataset. The high class imbalance in Kuzushiji-49 and Kuzushiji-Kanji is due to the appearance frequency in real textbooks and is kept that way to represent the real data distribution. Kuzushiji-Kanji is created for more experimental tasks rather than merely classification and recognition benchmarks. The proposed model aims to generate Modern Kanji version of a given Kuzushiji-Kanji input, in both pixel and stroke based formats. In the figure below, the overall approach is presented. They train two separate Convolutional Variational Autoencoders, one on the Kuzushiji-Kanji dataset and another one on a pixel version of the KanjiVG dataset rendered to 64×64 pixels for consistency. The architecture of the VAE is identical to . And both datasets are compressed into their own 64-dimensional latent space, z_old and z_new. The KL loss term is not optimized below a certain threshold. Then, a Mixture Density Network (MDN) is trained with 2 hidden layers to model the density function of P(z_new | z_old) approximated as a mixture of Gaussians. We can then sample a latent vector z_new given a latent vector z_old encoded from Kuzushiji-Kanji. The paper says that training two separate VAE models on each dataset is much more efficient and achieves better results compared to training a single model end-to-end. In the last step, a sketch-RNN decoder model is trained to generate Modern Kanji based on z_new. There are 3600 overlapping characters between the two datasets. 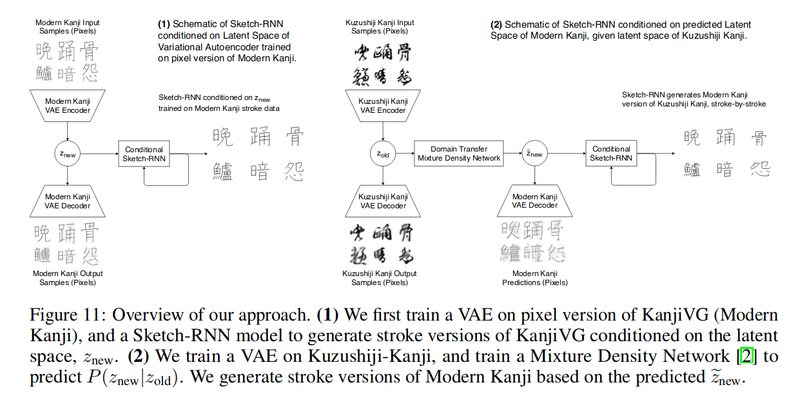 This helps the sketch-RNN fine-tune aspects of the VAE’s latent space that may not capture well parts of the data distribution of Modern Kanji when trained only on pixels.